SpongeBob and his friends are back-and like you've never seen them before-in the all-new blockbuster hit The Spongebob Movie: Sponge Out of Water, which is currently available on Blu-ray and DVD from Paramount Home Media Distribution. Hailed as "laugh-out-loud funny" (Examiner) and "the best family film of the year" (Fanboy Nation), the wildly entertaining adventure is also on Digital HD. To celebrate this hit animated movie, we have a new contest lined up where fans can take home the Blu-ray. On a mission to save his world, SpongeBob SquarePants is headed to ours. When pirate Burger Beard (Antonio Banderas) steals the secret recipe for the beloved Krabby Patties, SpongeBob and friends come ashore to bring back the missing formula. To succeed, they must team up with former rival, Plankton, but soon realize that to defeat a super-villain, they must unleash their inner superheroes. 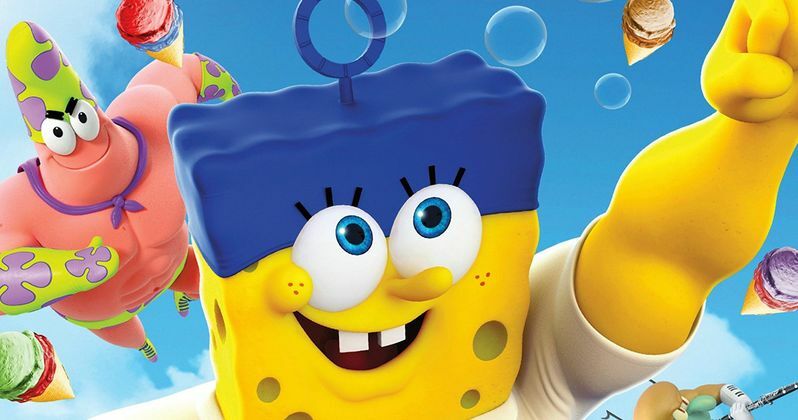 Reprising their voice roles from the SpongeBob SquarePants TV series are Tom Kenny (Spongebob), Clancy Brown (Mr. Krabs), Bill Fagerbakke (Patrick Star), Rodger Bumpass (Squidward Tentacles), Carolyn Lawrence (Sandy Cheeks) and Mr. Lawrence (Plankton). The Spongebob Movie: Sponge Out of Water Blu-ray Combo Packs with Digital HD boast over an hour of super-powered extras highlighted by three exclusive and delightfully fun sing-along music videos: "Thank Gosh It's Monday," "Teamwork" and "Theme Song/Rap Battle." The Combo Packs also include eight exciting featurettes that take you from Bikini Bottom to the surface, deleted scenes and more. The Spongebob Movie: Sponge Out of Water Blu-ray will surely provide a night full of family entertainment, so what are you waiting for? Check out how you can take home the Blu-ray today. "Squeeze Me" Music Video by N.E.R.D.